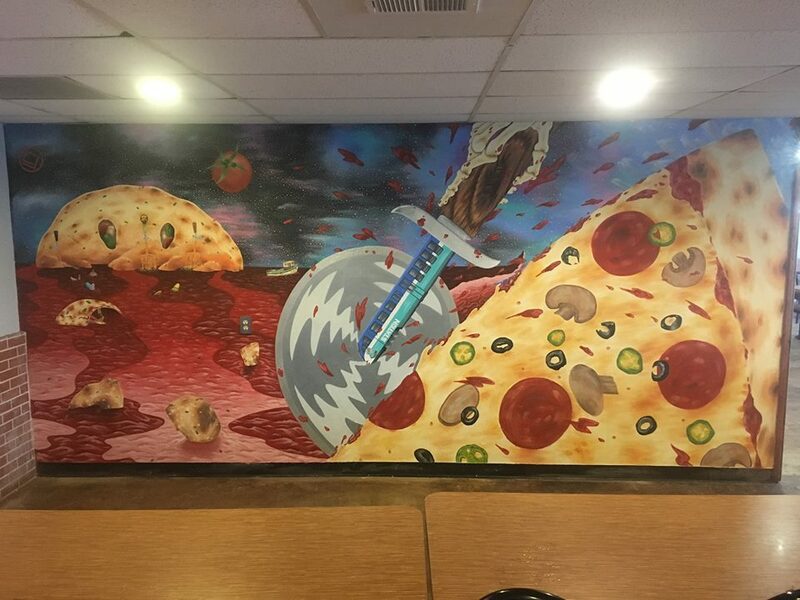 Mural for Station Pizza in San Marcus. Marinara sea. Calzone island with cascading beer tap waterfalls, pizza waves, pizza topping line up, etc.. so fun to paint this one..
Roadrunner mural painted for the Joshua Tree Music Festival, October, 2018. Two piece mural, 16x14 foot (on two panels). 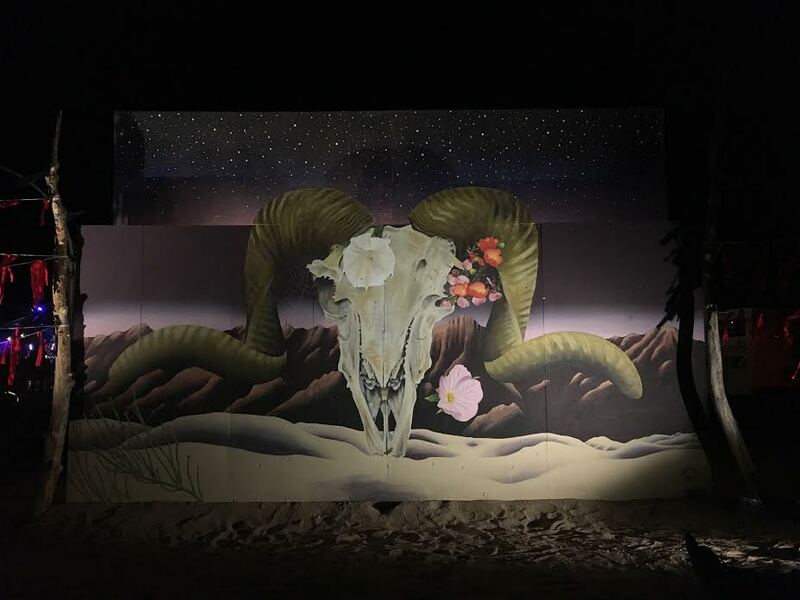 A mural i painted for the Joshua Tree Music Festival 2018. It deals with ideas of life and death, celebrating both simultaneously. 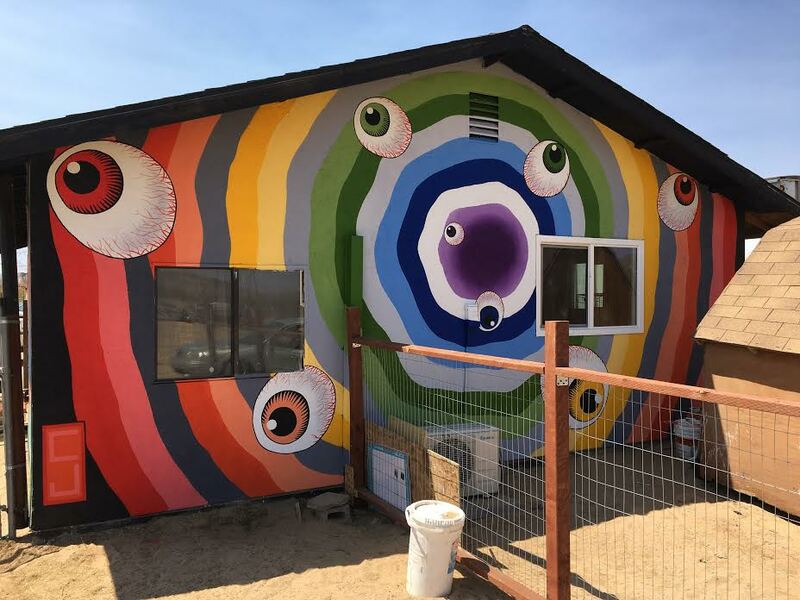 Trailer mural project out in Landers, just outside Joshua Tree. Indoor mural of Prickly Pear cactus blossoms. Japanese mural in Encinitas, "Reiho-Fuji Sanroku-Sakura maki" which translates roughly to "majestic Mt. Fuji, from the base, with cherry blossoms painting." I wanted to paint this wall (45x25) as close to traditional Japanese style as possible, specifically ukio-e, which was done using wood blocks. Being a fairly good sized wall I was conscious to not overdo or clutter the imagery, also keeping the color scheme simple with lots of negative space. This mural depicts a sunrise, in spring, which represents a new, fresh start. 101 and D Street, Encinitas (backside of 7-11), tribute to two amazing human beings.. Adjacent to the Prince/Bowie mural, this is the owner of 7-11s dog, Ollie. Originally he wanted Ollie on the same wall as the two, but we decided a separate scene would be better. Sapeurs in the Republic of Congo, on the wall of Culture Brewing in Solana Beach. This mural along with canvas pieces will be up the entire month of June. Jungle Space w/diatoms. Aka "where is my mind?" These faces were painted by an unknown artist before i painted my murals. I dig them so i kept them in tact, mostly. half shark aligator half man. no not really, but still a spider bird of paradise is a sweet mutant. I was invited to join the annual halloween "freakshow" at the Oceanside Museum of Art with my good friend Jason Wimer and a handful of other talented San Diego artists. The theme was traditional freakshow/circus style, essentially a vaudeville style show with a variety of attractions, including; live painting, contortionist, live taxidermy (that's right), dancers, as well as finished paintings on display. I contributed one finished painting, titled "The Siren of Surfeit", and one live painting which Jason and I worked on together during the event. The word "surfeit" means greed and excess. The Siren of Surfeit piece (left) portrays a typical freakshow banner with a twist. The "freak" on display is the stereotypical "normal" American consumer, while the audience members are the "traditional" freaks we all know, i.e. the bearded woman, fat man, etc. The point being that to be true to ones nature is normal, we work with what we were given, accepting imperfections and limitations as part of life. These "freaks" as we call them, are their natural selves, and therefore actually quite normal. The real freaks are those who constantly try to modify, enhance, overcompensate, overfill and overdo their lives with material items (food, clothes, cars, etc.) and medical procedures to make themselves happy. This lavish and never-ending desire for fulfillment from material items has negative affects not only on the individuals physical and emotional state, but also those around them, near and far, and ultimately the natural environment which we all share. The end result of this excessive lifestyle is an emotional, physical, and environmental deficiency, as it is not sustainable. The "Siren of Surfeit" holds many items representing this lifestyle, including the severed head of her own baby, as we are ultimately killing ourselves. The live painting was a collaborative piece with my good friend Jason Wimer. We decided that the canvas itself would be painted like the side of a circus tent, with a "freak" of sorts ripping out of the tent and into the outside world. Essentially the freak is the inner animal in us all, our true self, the tent is our ego, and escaping this represents transcendence to our uninhibited natural self. The piece is 5x6 foot, brush and spray paint on canvas. All in all it was a great night , full of strange art, family, friends, and even some much need rain. Jason and my mutual friend David Shull even made a guest appearance, which made things all the more enjoyable. Thank you to everyone involved, especially Kimerberly Mullen at the OMA for the invite and all her hard work. Until next year….stay freaky ya'll! I traveled down to San Jose Del Cabo, Mexico, with my family last week, and by chance wandered into a health food store named Green Goddess. With no forethought, I asked who I later learned was the owner, Kristen, if she would let me paint something on one of the walls. With very little hesitation, she agreed to me painting a small cooler in the corner, and to return the following afternoon to begin. The next day I brought what little paint and brushes I'd brought with me to the shop. Pressing my luck, I asked Kristen if it would be ok if, instead of painting the side of the cooler as she previously mentioned, I could paint the entire side wall. She thought for a second, then said that would be fine. Later that day I found an art store, stocked up, and canceled my return flight. What took place over the next week and a half was an adventure full of wonderful new people, flavors, and merciless heat. Thanks to Kristen, I was able to rent out a room just up the street from where i'd been staying with my family, with a local tattoo artist named Carlos (a.k.a. Master) and his pit bull Archy Rush (Archy for Matt Archibald and Rush as in the band). Heres the lower left corner of the reef, note the Rock Fish lounging, waiting for his prey to come near. I chose to paint a reef, as that area in Mexico is world famous for its amazing sea life. The mural itself is a work in progress, eventually filling the entire wall, including more reef, fish, water, waves, and a day of the dead surfer girl getting barreled. It looks a bit superimposed now, a colorful reef on a white wall, so use your imagination for the time being. Unfortunately I only had a telephoto lens for my camera, so the pictures don't show the reef, nor wall, in its entirety. Thank you to my new friends Kristen, Grace, Carlos, and Rush, for their kindness and support. If you're ever in San Jose Del Cabo and craving some amazingly delicious and healthy treats, I HIGHLY recommend Green Goddess, or perhaps some new ink, check out Ink Incorporated Tattoo. Electrical boxes are difficult to work into a reef mural, this much I learned. Here's the best picture I could take of the whole reef as I left it. Definitely looking forward to painting the background soon. My good friend, Thomas Curry, opened a beach house (bar) in Zushi, Japan, and asked me if I could paint a mural under the counter. He had an image in mind of a picture of him raising his hands into a beautiful sunset on the same beach the bar was to be built. All in all, the job only took a few days, and it was fun to sit in the sand while painting. When things got too hot, a dip in the ocean and an ice cold beer cooled things off nicely! In the bottom right corner, beneath the sink, is Enoshima island. LIVE PAINTING, Pink Cow, TOKYO, Japan, April 2013. This live painting I chose to paint a Camelia tree, because they were blooming at that particular time. These are one of my favorite flowers. I chose to paint the bush/tree from a distance, as oppose to close up, because I feel the green in the leaves really brings out the beauty in the red flowers. Painting next to amplifiers and kick drums is the best!! Nothing like live music to keep you motivated. Finished product. Photo taken in Roppongi train station, 12:30 am. . This live painting I chose to paint a Magnolia flower and tree. Once again, this flower was blooming at the time. Someone told me that this is one of the oldest flowers around, dating back to the days of dinosaurs. Painting the image upside down is an interesting practice. Finished product, currently exhibited in Ciel Hair Salon in Motomachi, Japan.